It is true that a number of dog collars on today’s market are made with reflective features. These are made with strips or stitches that reflect ambient light, thus giving you a quick look at where your dog is. But the problem is that sometimes it might be difficult for such reflective items to work. This is especially the case when you are walking with your dog during the evening hours and there is hardly any ambient light in a given area. And as any dog owner knows, you really want to know where they are at all times to keep your dog safe. This is where a shock proof flashing dog collar can come into play. These are water resistant flat collars that use a simple lighting mechanism that can give off continuous light or flash mode that can be set to a slow flash or a fast flash. 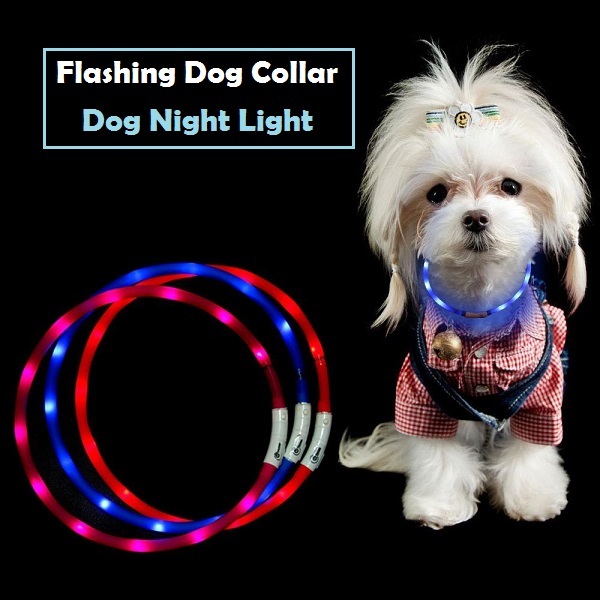 It uses a series of small bulbs that make it easier for your dog to be visible. The light dog collar is typically powered by a USB rechargeable battery that is hidden inside a small battery compartment within the dog collar. A flashing dog collar will be great for when you are trying to get something for your dog to wear in dark situations. 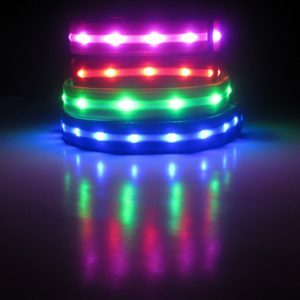 While it works well for when you’re walking your dog while it is dark, it could also be useful for decorative or party-related purposes. You can have your dog wear it during a special event where there are lots of festive things happening. These all use LED bulbs as well. 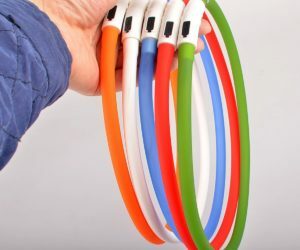 These do not generate heat and are also easy to charge whether it is through a battery that you can add or a USB cable that adds power to the battery included in it. There are a number of beautiful flashing dog collar options for you to check out right now. Here are a few of the more popular options you can find today when looking for a great flashing dog collar. A quick note: Some of these collars require you to cut a few pieces as a means of making it easier for the collar to fit around your dog’s neck. Not all collars work like this but it helps to watch for how it can be utilized. You can charge up this collar with a USB connection. Just secure the collar into a USB port with a proper wire and it will charge up the battery. This allows the LEDs on the inside the light up for a while. You can also use a small on/off switch on the buckle area to turn it on or off. This is a slim switch that your dog will not trigger. This can run for about eight hours on a full charge. It also produces one of many colors depending on the model you choose. You can order a green, black, purple, or blue collar among other options. You can even use a separate switch on the collar near the power switch to adjust how the lights are displayed. They can blink or go on a strobe setting. The collar can also be visible from about 350 yards away. To use this collar, a CR2032 button battery is needed. It can be secured around the buckle area and is applied carefully so it will not be in a spot that your dog could possibly access. The battery will last for about 60 to 80 hours and will produce a light that can be seen from about 1,000 feet away. The slim switch on the collar allows you to turn the light on and off. You can also set it to a fast or slow-blinking display. It is all made with a nylon body. 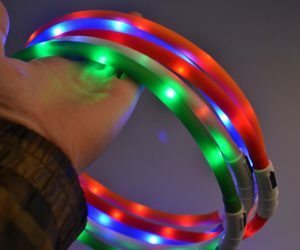 It offers a solid body that is comfortable and supports LED bulbs that string all around the collar to create an even color display all the way through. This can be ordered with a matching leash. It is also available in three sizes and four colors. This is also a water-resistant model that does well in rainy conditions. It is not necessarily for underwater use though. 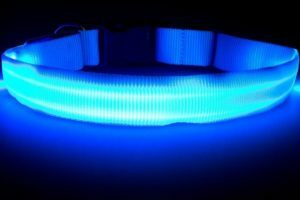 This LED collar is a little different in that it is about 27.56 inches long and has to be cut with scissors to fit your dog’s neck. It should not be tough to get a good idea of how long the collar should be as it is flexible enough to let you test it on your dog. It can be cut with scissors and it will not impact all the other LEDs on its design. If anything, the open end will fit into the base of the collar with ease and not come apart quickly. A USB cable can be used to charge up the collar. It does not require a battery for use. The light will last for about three hours on a charge but it only takes about half that time for you to actually charge it all the way. You can also turn the collar light on with the slim switch on its body. B.Seen has made this dog collar with a great look that is carefully organized for a beautiful look. It has eleven LED lights around its body. Like with the prior option you read about, this is also around 27 inches long. It requires you to cut part of it to help you get a proper fit around your dog’s neck. Again, it is still easy to cut and measure properly. This is also a USB-rechargeable model that does not require batteries. It also uses a button that you can use to turn it on or off. It even uses a blinking system that can be turned on to allow the lights to blink on and off. It takes about two hours for you to charge the collar. This also glows for about the same time on a single charge although it can last a few hours more if you use a blinking setup on the collar. 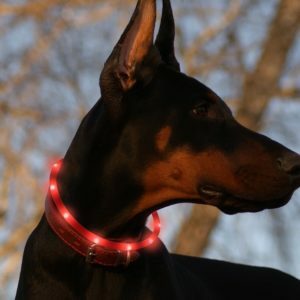 All of these flashing dog collar options will give your dog a beautiful look and keep your dog safe. Check these all out the next time you’re looking for something that your dog is bound to enjoy wearing while making your beloved pet easier to spot.